mmm...signed perfection! Of course, I cropped this so you can't see what he wrote. Beer, are you sure that it's not just a blank cdr? I'm afraid to listen to it. No no i made sure it worked befor we (or I i guess its all foggy, May 8th was crazy, LP was awsome too.) got it signed. Yes, that pose was just for you love, from Jody himselfe. True enough....he struck da pose yo. ..and yeah.. keep his little message to ya all to youself. HOTT! Really.. we all know you "cropped" it 'cause he didn't really write anything on it.. infact....looking closer... I don't think that's Jody at all.. THAT'S MY SON!!!!! Smashing! You've gotta love Jody. hey um where is it now? so is there any chance it'll get to me? The Pinwheel Demos are now available for your downloading pleasure at http://www.dimeadozen.org . Apparently I cannot post URLs for web addresses. Anyway, you can find the Pinwheel demos at dimeadozen (ez torrent) - do a search. um, dimeadozen wont let me register... can anyone help me get my hands on these demos?? really slow responce, but has anyone noticed they are avalable at the .us site? I was wondering if anyone could get the LoftyPop demos to me? Couldn't somebody just rip the songs, zip them, and put them up on www.yousendit.com? That would be awesome. Looks like I have to fix that page. It'll be back up shortly. I would love this cd too if anyone could send it to me (i'm in England) that would be great. Or if there's a download link that would be excellent. Hi. 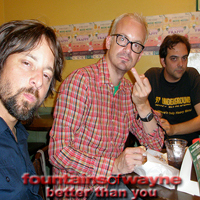 They have been on the fountains of wayne.us downloads section for a long time. Click on Pinwheel demos and then rigth click and save the mp3s to your PC. Hope that helps. Thanks i have never really explored this site to the full.